A word of caution for those starting out with the Petrov – if White takes the Pawn on his third move, Black shouldn’t immediately take White’s Pawn. As E. E. Cunnington says in Chess Opening For Beginners, "... the Pawn cannot escape." More importantly, though – The Mammoth Book Of Chess by Graham Burgess points out that if Black takes the Pawn with his Knight, White then moving his Queen to e2 "wins material". The Mammoth Book Of Chess illustrates a couple of lines with a real-life example (from then-future Grandmasters Nigel Short and David Norwood when they were ages 10 and 6 respectively) and the ideal play at move 4 for Black if he does in fact take the Pawn on move 3. 1. e4 e5 2. Nf3 Nf6 3. Nxe5 Nxe4 4. Qe2 Nf6 5. Nc6+ "Black overlooks a simple idea. 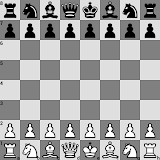 He has to play this line, hoping for compensation for a pawn in the play following 6. d4"
It doesn’t seem to be so popular lately due to it being considered an opening that often ends up with a draw, although Wikipedia mentions that "Grandmasters Karpov, Yusupov, Smyslov, Marshall, Kramnik, and Pillsbury have frequently played the Petrov as Black." For my own sake as much as anyone else’s, I plan on going through my books and searching for Petrov’s Defence examples. There are a multitude of examples online, but hey, I like books (although the irony of then publishing them online isn’t lost on me...).